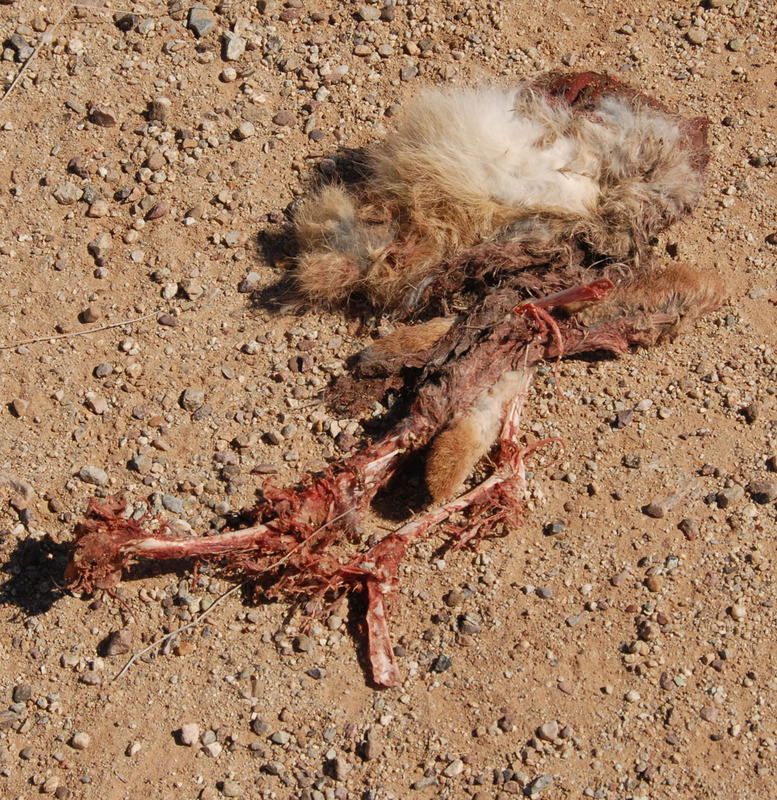 In older scientific classifications of birds, all "vultures" were grouped into the order Falconiformes (falcons and caracaras). 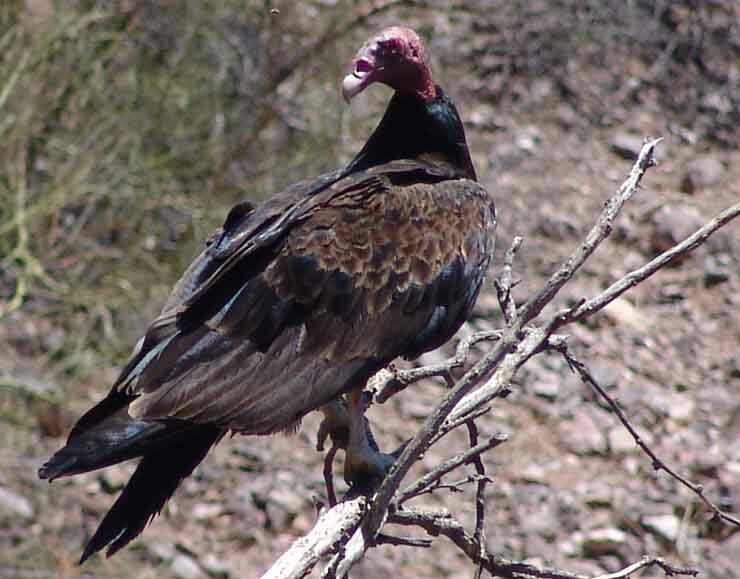 In the 1990s, New World vultures (7 species) were reclassified as Ciconiiformes, along with storks and herons. 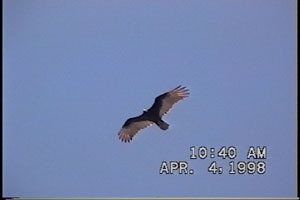 Recent genetic studies, however, have led such authorities as the American Ornithologists Union to place vultures in the order Accipitriformes (ospreys, kites, hawks and eagles), and then within the family Cathartidae (lit., "purgers", referring to a habit of vomiting when threatened by predators). 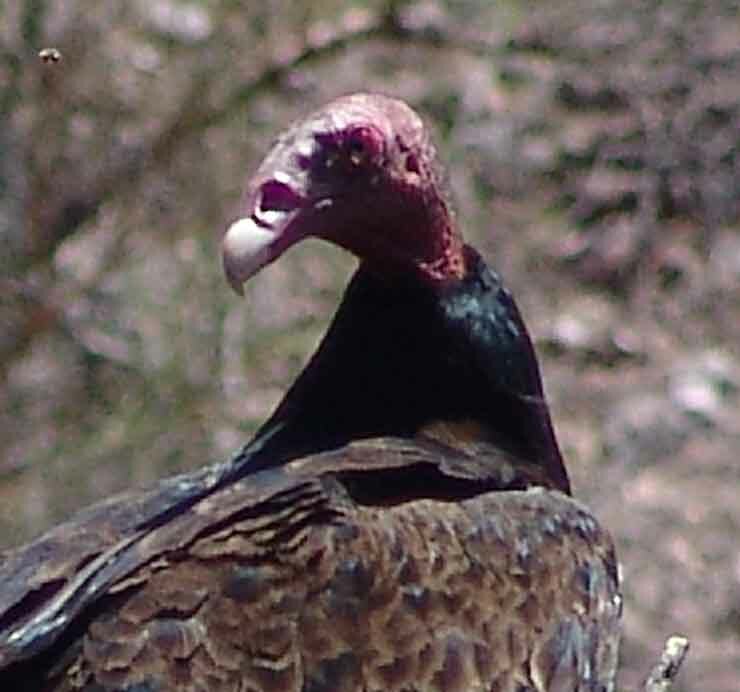 Old World vultures (15 species) are not considered closely related to New World vultures, although they are also placed within the same order Accipitriformes (family Acciptridae), based upon evidence of convergent evolution. 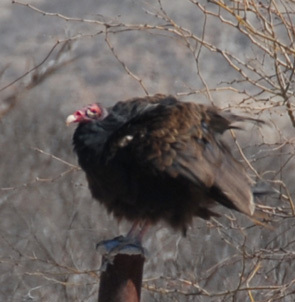 While Old World vultures have the grasping talons of true raptors, the New World vultures have weaker, fowl-like feet, and cannot carry food with these appendages. Though we have the Black Vulture in our area as well, the Turkey Vulture is our much more common of these two summer visitors. A large bird (some 26" long, weighing around 4 lbs, with a wingspan of about 6 feet), it has a distinctively red head in the adult and a mainly brownish body, as evident in the images above and below. 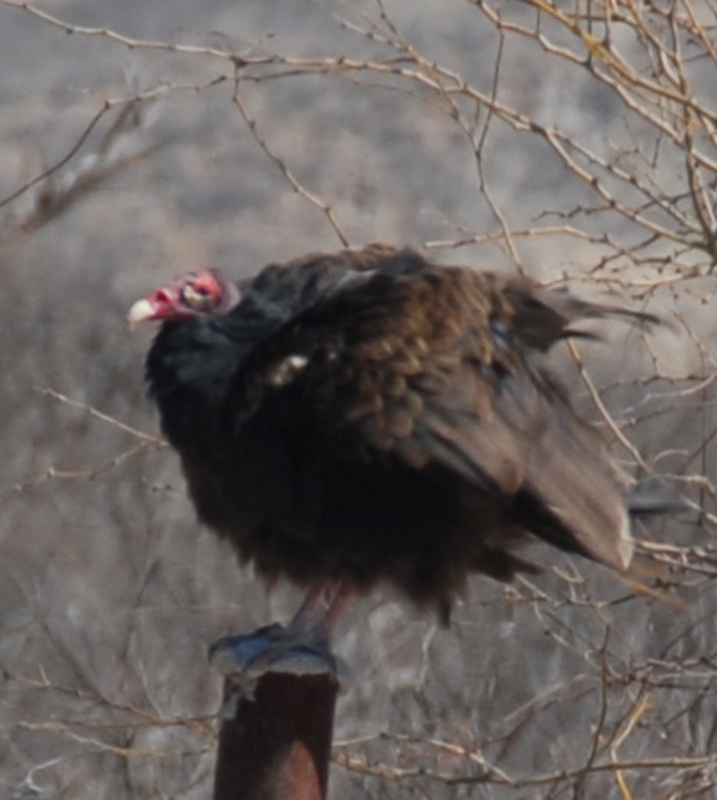 The Black Vulture (Coragyps atratus) as its name implies is all-over black to gray. 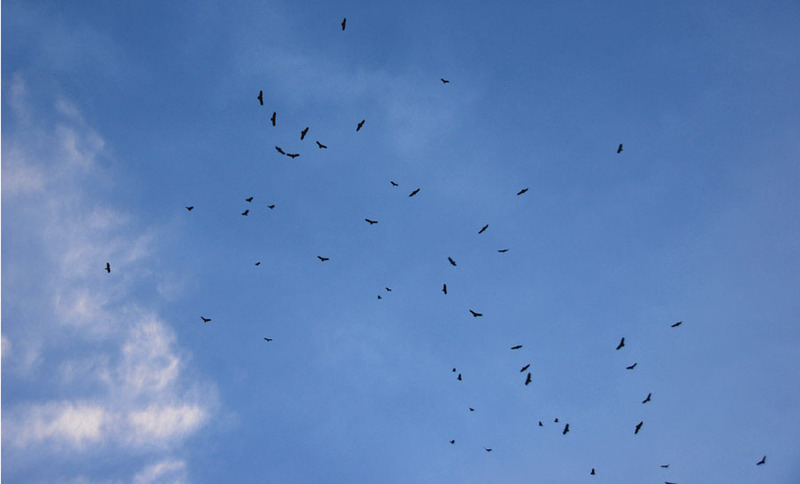 They breed locally but depart from our lands in October to winter in Mexico, and return in March, where they often soar at high altitudes, as this large group below did in the evening light on March 13, 2008 over the San Pedro River near Teran Wash.
Turkey Vultures often guard our Saguaro Juniper gateways (see the trio of sentinels, standing firm against intruders, below right). 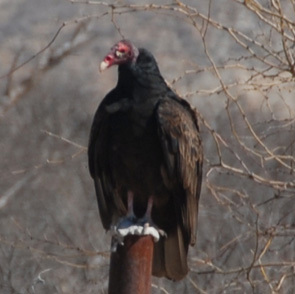 See this link -- The Turkey Vulture Society -- for a valuable further source of information.